Definition at line 11 of file generators-test/lib/c.cpp. Definition at line 14 of file lib1.cpp. Definition at line 16 of file generators-test/a.cpp. 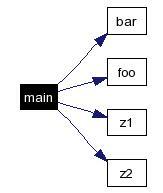 References bar(), foo(), z1(), and z2().